This recipe! 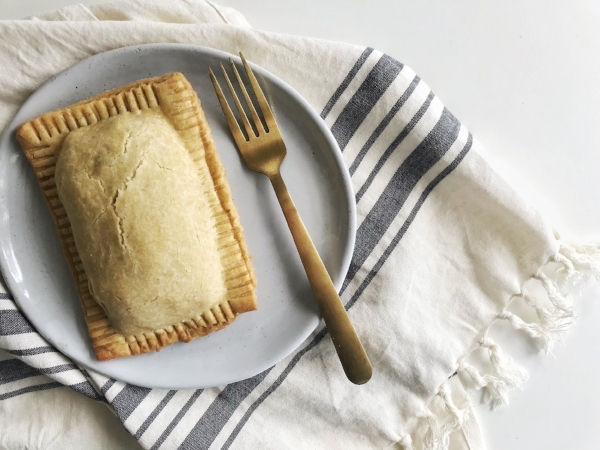 One of the simplest & tastiest hand pie recipes I’ve ever made. It’s only 4 ingredients, so easy to work with, + gluten free, dairy free (& vegan if you use a different filling.) I adapted it from a pop tart recipe off of kyrabussanich.com & it’s amazing! First things first - make your filling.In a medium sized sauce pan heat olive oil over medium-high heat. Sauté celery, onion, & carrot until the onion starts to become translucent - about 8 minutes. Add in your peas & corn - cook for another 5 minutes. Lower heat, add in your shredded turkey, cashew cream, almond milk & all spices. Stir until well combined. Remove from heat & cover with a lid. Set aside to make dough.Now for the dough!Preheat your oven to 400F & line a large baking sheet with parchment paper. Set aside.In a food processor add all ingredients except water & pulse until little pea sized dough balls form. Slowly pour in cold water until dough starts to stick together & form a ball. You want the dough to be easy to handle when you touch it - not sticky. If so, add a little more cassava & if too dry add a little more water.On a piece of parchment paper sprinkled with cassava, roll out your dough with a dusted rolling pin. Roll until 1/8 in thick. Using a knife or pizza cutter (I use a pizza cutter - so confident) slice the dough into 5x4 inch rectangles. (You’ll need 6 rectangles total - 3 for the base of your hand pies & 3 for the top of your hand pies.) With a spatula, carefully transfer 3 rectangles to the prelined baking sheet. Fill the base of the hand pies with turkey pot pie filling. Leaving a half an inch around the entire perimeter of the dough. Once all 3 hand pies bases are filled, wet your finger with a little water & line the perimeter of the dough. Transfer remaining 3 rectangles to cover the filling of the hand pies and press down gently on the sides. If dough starts to crack don’t worry! The dough is very forgiving. Just wet your finger a bit & repair the crack but rubbing it a bit to make it stick back together. I use the edge of a fork to crimp the sides as well.Pop in the oven for roughly 15 minutes or until golden brown. Let cool slightly & enjoy!